When I was a ten-year-old, almost everything I heard on the radio or saw on Countdown was intensely exciting and shrouded in adult mystery. It got my heart and imagination racing – bodies moving in rhythmic ecstasy, and the fantastic edifice of a stage. But a few songs took that enigmatic frisson of the body and its taboos, and turned it up to eleven1. One of these songs was performed by the inimitable Ian Dury – “Spasticus (Autisticus)”2. In this post, I want to follow my suspicion that the dynamic of this song can shine some light on the nature of poetry, and on how we might live together. Over the course of the next four weeks, I want to put some thoughts down about form and deformity, poetry and reading, what separates and connects us. This week, it’s about normality and solidarity. 1981 was the International Year of the Disabled. Charity and pity was the dominant mode of engagement with disability. In protest, Ian Dury wrote “Spasticus (Autisticus)”. He wanted to confront people with the subjective actual reality of disabled people’s lives, through jet-black humour, shocking language and his trademark punk-funk groove. The song’s title is spat out with obvious relish dozens of times in the course of its catchy three minutes, the unsayable said over and over. “I’m Spasticus. I’m Spasticus. Spasticus Autisticus”. For all the repetition, it might have approached the realm of sound poetry, were the words not so persistently discomforting. Another thing I didn’t know at the time was the fact that “Spasticus Autisticus” sourced its provocative title, and its politics, from the 1960 Stanley Kubrick film “Spartacus”.4 At a key moment in the film, recaptured slaves, who had been rebelling against their Roman rulers, are told that their lives will be spared if they will only identify which of them is their leader Spartacus, and it is he who will be executed. Rather than betray him, one by one each slave steps forward and declares, “I am Spartacus”. Soon enough, hundreds of slaves are standing in unison, in a tremendous and sobering act of solidarity. In the early 1980s, “spastic” was a vicious schoolyard slur. It implied physical limitation, a body which couldn’t look after itself, couldn’t move smoothly or independently, and certainly couldn’t possibly match up to the ideal of beauty. It was a word, too, that assumed a lack of intelligence. We still fear these “shortcomings”. Fear them deeply. Yet, surely, not matching up to “normality” is common to all of us.5 Words like “spastic” signify the wholly Other, the bottom rung of the social ladder. These are words rooted in ideas of biological determinism, yet they only have their power through speech, the act of labelling and exclusion. They create absolute difference – locking the so-called “spastic” in the ontological and social basement, while the majority try to carry on “as normal” (pun intended) in the world above. In reality, the divisions aren’t so clear or strong. We are all swimming in the same pool. There is an otherness within each of us. “Spastic” was never a word that was thrown at me. “Hunchback” was. And many others. In my teenage years and my twenties, I was stared at and occasionally mercilessly taunted. I have a genetic condition called Marfan Syndrome, which for me has meant severe scoliosis.6 In the wake of this, I became a poet gradually. I wrote quietly and intently to the readership of myself, until in the late 1990s a friend encouraged me to read my poems at open mic nights and readings. I stood up and read, mostly short flawed lyrics of mild social rebellion with intimations of bodily pride I didn’t quite have yet – a confidence that existed in spite of my unusual shape, or perhaps even because of it. And at these poetry readings, on the stage, I felt a powerful silence come back. A silence that was the opposite of empty; that was filled with thought, feeling and ambiguity. If I think of all the poems over the years that have affected, inspired and haunted me the most, they share this characteristic – in them, I experience a voice (or a perspective or a world, it’s hard to say) that is utterly unique and strange, yet simultaneously intimately familiar. Reading these poems, I find myself identifying with the voice in them, while acknowledging how different it is to my own. All this happens within my body. Not mindlessly, because it often involves a kind of intellectual grappling, but it’s still fundamentally a physical experience. I find myself seduced into recognising what interests I share with the life in the poem, and pondering how this might translate to the world I experience. 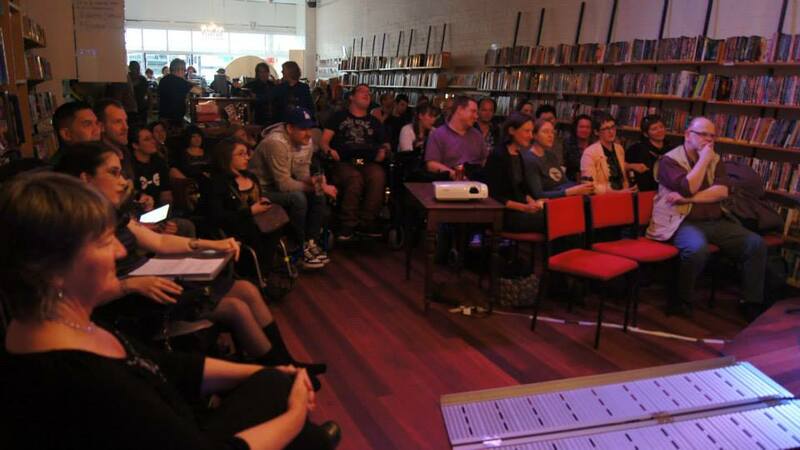 At the Melbourne Fringe Festival last year, I was part of a performance event called “Quippings: Freaktastic”.8 Quippings is a regular9 night of poetry, stand-up, storytelling, music and performance by people who identify as disabled or Deaf. The name is a fusion of crip and queer, with the added apt connotation of the witty, cutting remark. Quippings nights are subversive by their very nature – disabled people being visible, owning their difference, laughing at the narrow-mindedness of many “able-bods”, and challenging stereotypes of all kinds – above all, speaking for ourselves. In a draft of this essay, I wrote “speaking for themselves”. But my involvement in Quippings has involved that exact shift – from “them” to “us”. In a way, this was my “Spartacus” moment. I stepped forward, because something in me recognised a commonality, a connection. And this something has been nourished not only by my experience of being physically different, but through my experience of poetry. Looking back, I can see that my reading and writing life so far has been about connecting my own particular bodily experience with the bodies of others. I have been trying to articulate affinities, becomings,10 solidarity. Not to reduce difference, but to empower it, through resonance. Yet, even though these “books” of physical difference can be hard to comprehend or understand, I think they are there for the reading. It just takes attention and a commitment to move beyond the familiar, towards the poetry of our bodies. I hope, over the course of the next few weeks, that’s where we’ll go. Next week, medical tourism and poetry tourism. 1 This is Spinal Tap. Dir. Rob Reiner. Embassy Pictures, 1984. Film. 2 Ian Dury. “Spasticus (Autisticus)” Lord Upminster. Polydor, 1981. CD. 3 16 Songs Banned by the BBC”. BBC. n.d. Web. 2 March 2015. 4 Spartacus. Dir. Stanley Kubrick. Universal International, 1960. Film. 5 Davis, Lennard J. Bending over Backwards: Disability, Dismodernism, and Other Difficult Positions. New York: New York University Press, 2002. Print. 6 Marfan Syndrome is a disorder of connective tissue affecting the production and operation of fibrillin in various parts of the body – heart, eyes, joints, etc. It affects each person to varying degrees. 7 The Macquarie Concise Dictionary. Sydney: Macquarie University, 2001. Print. 9 Actually, “irregular” would be a better descriptor, in the sense of how often it happens, but also in the sense of the non-normative identifications of the performers. 10 Deleuze, Gilles, and Felix Guattari. A Thousand Plateaus: Capitalism and Schizophrenia. Minneapolis: University of Minnesota Press, 1987. Print. 11 “Disability Prevalence”. Australian Bureau of Statistics. ABS, 2 May 2011. Web. 3 March 2015. 12 Shildrick, Margrit. Embodying the Monster: Encounters with the Vulnerable Self. London: SAGE Publications, 2002. Print.